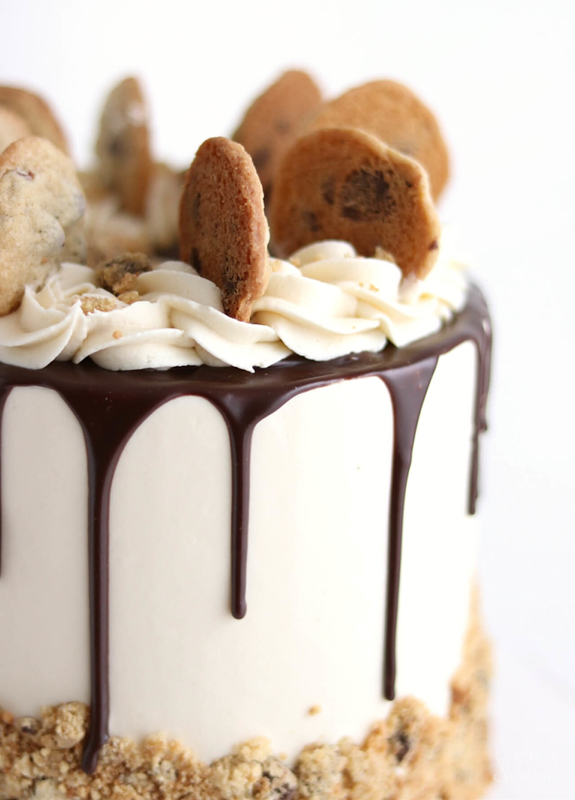 It’s a chocolate chip cookie flavored cake with vanilla buttercream, chocolate ganache, and plenty of homemade chocolate chip cookies on top! 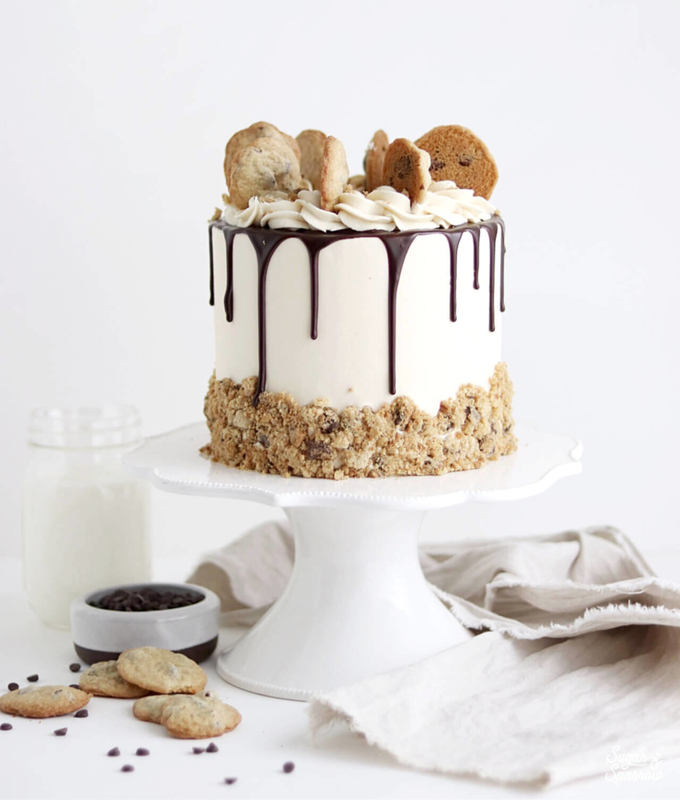 I’m calling it a Milk & Cookies Cake as a nod to its inspiration. Let’s talk about this cake. I based the ingredients off of my favorite chocolate chip cookie recipe, so there are both brown and white sugars involved in the creaming process. The brown sugar gives such a deep, rich flavor and adds a little bit of moisture. I wanted it to be extra moist though, so I added a some sour cream to the batter as well. And after learning that regular-sized chocolate chips are too heavy for this cake batter (they sink to the bottom!) I opted for mini chocolate chips instead! They’re super cute and won’t sink to the bottom of your pan, which is a win-win in my book. If you can’t find mini chocolate chips at your grocery store though, don’t fret. I’m sure chopping the regular-sized ones up into bits would do just fine. 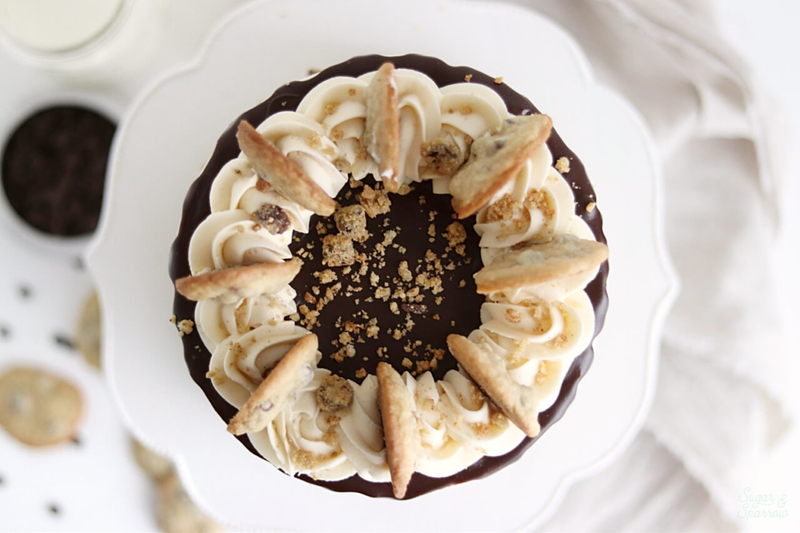 Vanilla buttercream is the milk to this chocolate chip cookie cake, and it provides a nice subtle flavor to wrap it all up in. Just like milk to a cookie, it’s a great complementary flavor that doesn’t try to steal the spotlight. Not too sweet, just right. Like I said before, I’m all about the basic recipe on the back of the Hershey’s chocolate chip bag (although sometimes I get a little crazy and substitute the vanilla extract for almond extract – so tasty! ), but if you’ve got a favorite chocolate chip cookie recipe and want to make them your cake toppers, my hat’s off to you. If you want to use store bought cookies like Chips Ahoy instead, you totally have my blessing. 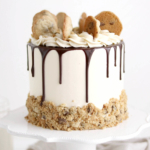 However you decorate it, you can be sure that this cake will satisfy all the cookies and milk loving people in your life! 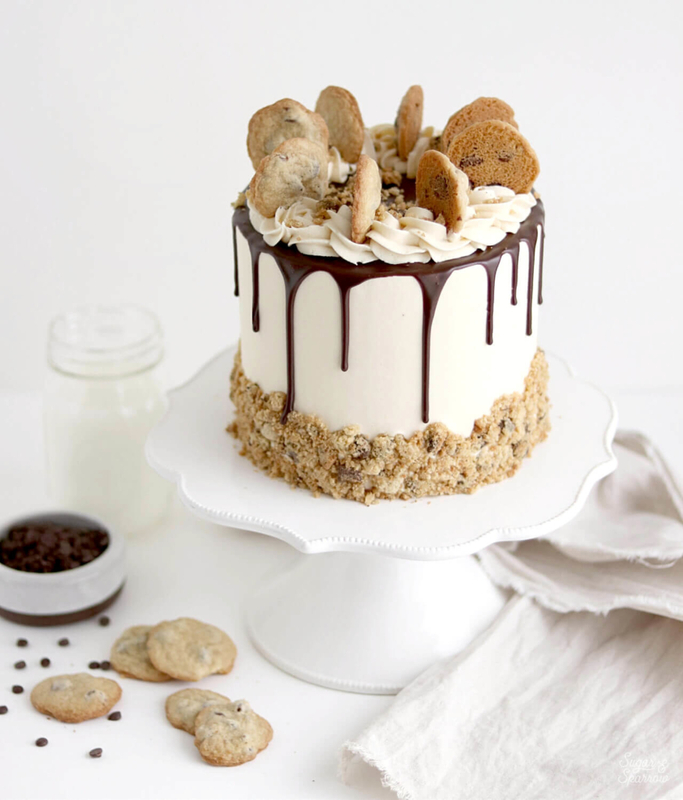 A decadent chocolate chip cookie flavored cake topped with vanilla buttercream and extra chocolate chip cookies for good measure. Preheat the oven to 350°F. Prepare three 6-inch cake pans by spraying the sides with a cooking spray (Baker’s Joy is my favorite) and a wax paper circle fitted to the bottom of the pan. Alternatively, you can grease and lightly flour the pans. In the bowl of your stand mixer (a handheld mixer works fine too! ), cream the butter for on high for two minutes until it’s light and fluffy. Add in white and brown sugars and continue to mix on medium-high for another two minutes, scraping down the bowl and paddle as needed. Turn the mixer to low and add the eggs one at a time. Add the vanilla and sour cream, turn the mixer to high, and mix for one minute, scraping down the bowl and paddle once more. With the mixer on low speed, add in the dry ingredients and mix until just combined. Add the whole milk mixture and mix until just incorporated. Scrape down the sides and bottom of the bowl and give it a few stirs to make sure there are no lumps, then fold in the chocolate chips. Batter will be slightly thick, but pourable. Pour batter evenly into prepared cake pans (about 2/3 of the way full) and bake for 35-40 minutes. The cakes are done when they spring back to the touch and a toothpick inserted into the middle comes out clean. Let the cakes cool in the pan for five minutes before turning them out onto a wire rack for an additional few hours of cooling. Make sure they’re entirely room temperature before applying any frosting. With a hand mixer or paddle attachment on your stand mixer, cream the butter on medium-high until it’s creamy and light (almost white) in color. About 7 minutes. Add the powdered sugar, one cup at a time, scraping down after each addition and making sure each cup is fully incorporated before adding the next one. Add vanilla, milk, and salt and mix on medium-low for another two minutes until fully incorporated. Fill and frost the cake layers with vanilla buttercream. 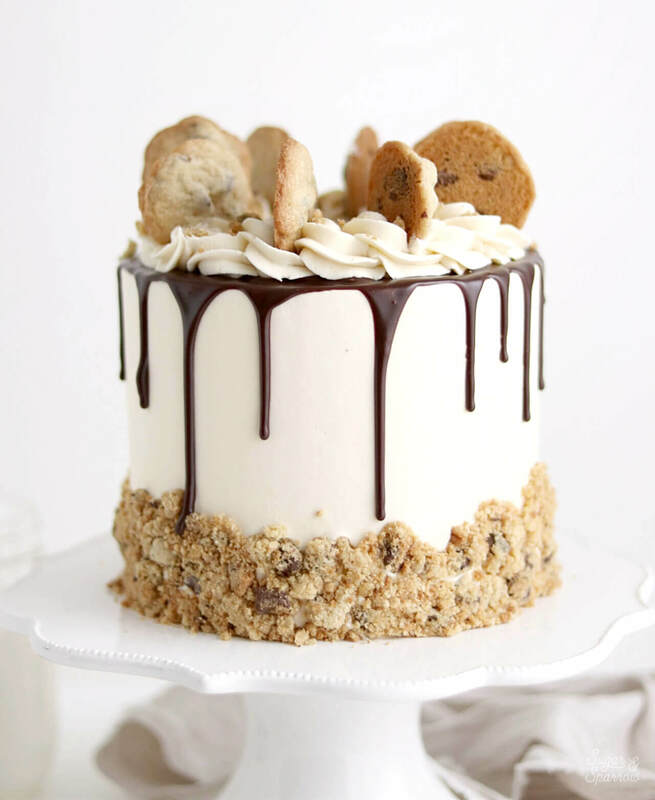 Crumble the chocolate chip cookies (either homemade or store-bought) and garnish the cake by adding them to the bottom third of the frosted cake, pressing the crumbles in to the sides. If garnishing with a chocolate ganache drip, chill the cake for 30 minutes before dripping with ganache. Finish by piping a border on top with vanilla buttercream (I used Wilton Tip 1M) and placing whole chocolate chip cookies on top. Make Ahead Tips: the cake layers can be made ahead and stored (wrapped in plastic) at room temperature for up to one day. Alternatively, you can wrap the cake layers in plastic and store them in the freezer for up to two months. When you’re ready to use them, thaw them to room temperature before continuing with the frosting and decorating process. The vanilla buttercream can be made ahead and stored in an airtight container at room temperature for up to one day. Alternatively, you can store it in an airtight container in the refrigerator for up to two weeks. When you’re ready to use it, bring it back to room temperature and re-whip with your stand mixer on medium for one minute to bring it back to frosting consistency. Hi Vicki! The reason I use cake flour for this recipe is because it’s what makes the cake super fluffy. You can use all purpose flour, but the cake will end up being more dense. There is a really easy way to convert all purpose flour to cake flour though: for every 1 cup of all purpose flour, remove 2 Tbsp, and replace with 2 Tbsp of corn starch. Repeat for however much cake flour you need. Sift the mixture 5-6 times (don’t skip that step), then measure out how much cake flour the recipe calls for. That should make your cake softer and fluffier than all purpose flour alone. Should i use sour cream in this cake !! Hi Hala! The recipe calls for sour cream, just for added moisture. I would definitely use it as the recipe calls for it! I’m thinking about making this tomorrow? 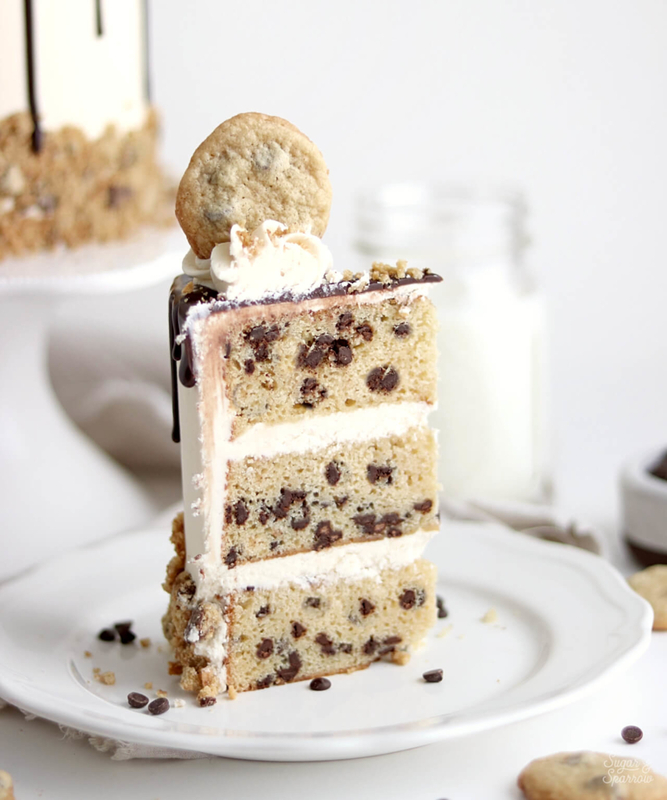 Is it too sweet though with chocolate chips all throughout the cake? Hi Colette! I don’t think it’s too sweet, especially since the chocolate chips are semi-sweet. I think it tastes just like a chocolate chip cookie in cake form, but if you think chocolate chip cookies are too sweet you could always reduce the amount of chocolate chips or reduce the white sugar by 1/4 cup or so. Hi Ana! Sour cream is a thick mixture similar to greek yogurt. You could totally substitute it for full fat greek yogurt, but I think milk cream is different than sour cream so I can’t recommend that as a substitute. If you don’t have full fat greek yogurt on hand, you could omit the sour cream, but the results may not be as moist. You could definitely give it a try though! Hi there! Making this cake for my daughters 28th birthday. The 6 inch round look so tiny to me, lol. The picture of the cake looks more like 8 inch rounds. Also, do I use 6×2 or 6×3? Thank you! Hi Robin! What an awesome way to celebrate your daughter’s birthday! Yes – the 6 inch rounds look small but when you have three layers it makes a good sized cake (feeds about 15 people!). The cake pictured is three 6-inch layers and I used 6 x 2 pans. Hello Whitney, I’m looking for an eggless cake recipe for my friend birthday and she loves cookies! Can I replace all egg with sour cream? Thank you. Hi Natalie! I’ve never made an eggless cake before and wouldn’t know what to substitute the eggs with. You can certainly try it and let me know how it goes, but since I’ve never tested it myself I can’t recommend substituting the eggs!